Hi Everyone! I've been very busy lately working like crazy. I've made a post to my other blog Gold Standard Finishes LLC on striped looks for a home that I thought you might enjoy. Here's one of my favorite photos from this post. 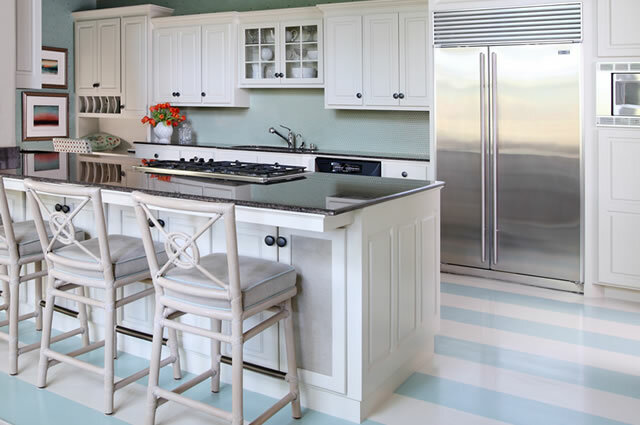 I just love this beautiful kitchen with this drop dead gorgeous striping. This photo features the work of Tobi Fairley who is one of my favorite interior designers. Since my paint company does decorative finishes in addition to regular house painting, be sure to either follow my blog on goldstandardfinishes.com or like us on Facebook to learn about our new painting posts!